Bengaluru: Delivering sustainable infrastructure solutions, Mphasis, an Information Technology (IT) solutions provider specializing in cloud and cognitive services and Stonehill International School, an Embassy Group education initiative, have partnered to donate and manage the day-to-day operations of two new school buses for Stonehill Government Higher Primary School, Tarahunise. The buses, donated by Mphasis, were inaugurated in a ceremony on March 5th and will offer school pick-up services to five surrounding villages in the Bettahalasur Panchayat, enabling students to reach school conveniently and raising attendance levels. Mphasis will also fund a year worth of operational and staffing costs, while Stonehill International School will handle the management. The measure is a response to dropping attendance levels at Stonehill as students face increasing difficulties of commuting from nearby villages. Mphasis’ donation is expected to have a profound impact on bridging the attendance gap, empowering students to attain new levels of educational achievement and removing one more infrastructural roadblock to success. These initiatives are the latest in an ongoing undertaking to transform Stonehill Government Higher Primary School through Embassy Group’s Community Outreach Program, which aims to improve the education outcomes for children from low socio-economic backgrounds in partnership with corporates, the Department for Education Board of Karnataka and other organizations such as Stonehill International School. One of Embassy Group’s 19 adopted Government Schools, Stonehill Government Higher Primary School has benefited from a complete school makeover in 2012 (including a new school building and modern facilities) as well as a host of high-quality, integrated educational support in subjects such as Mathematics, English, Life Skills, Art and Craft, and Sport. The school’s housekeeping and maintenance, sports activities, library and computer lab are taken care of by Stonehill International School, as part of their community outreach initiative. 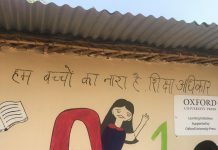 Meenu Bhambhani, Vice President & Head of Corporate Social Responsibility, Mphasis said, “We are acutely aware of resource challenges that are faced by children, especially in rural areas, to access educational institutions. We are delighted to partner with Embassy Group to address the issue of declining enrolment and dropout in Stonehill Government Higher Primary School. We are hopeful that our support will prove to be catalytic in increasing enrolment and improving learning outcomes for children”.